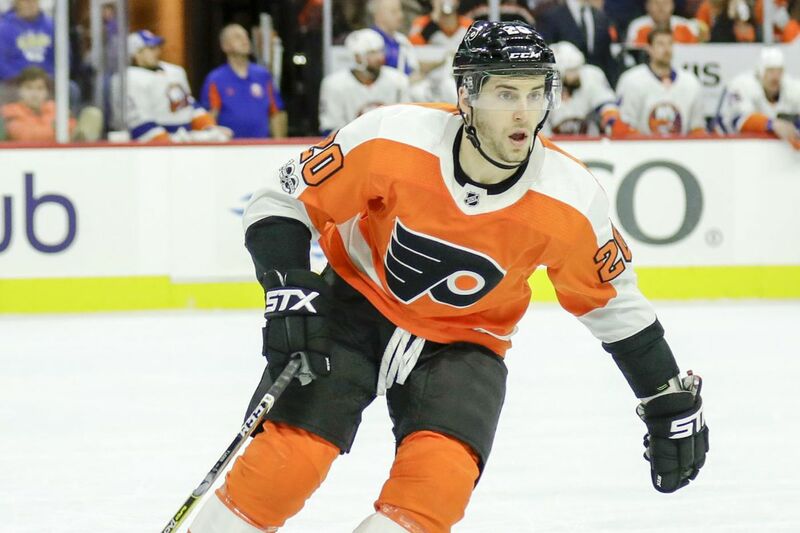 Flyers left winger Taylor Leier returned to the lineup Thursday. KEY PLAYERS: Jack Eichel (15-20-35) scored two empty net goals in the Sabres 4-2 defeat of the Flyers back on Dec. 22. Before being held pointless in a 4-3 loss to Winnipeg Friday night, he had 11 points (7+4) in his previous eight games. December tied as the second-most productive month of Eichel's career (8G, 8A), trailing only his 18-point output (9G, 9A) in March 2017. His totals tied him for second among all NHL players in goals and sixth in points among all NHL players in December. Sabres goaltender Chad Johnson, who won 22 games for the Sabres two seasons ago, is just 1-7-3 this season after Friday night's 4-3 loss to Winnipeg. Traded by the Jets as a malcontent in 2015, Evander Kane (16-19-35) was booed lustily by the home crowd each time he touched the puck Friday, and heard the chant "Best Trade Ev-er, Best Trade Ev-er''. With two goals Saturday, Sean Couturier (21-19-40) surpassed his career high for points in an entire season. He'd had 39 twice before, in 2013-14 and 2015-16. Couturier is the first Flyer to reach the 20-goal mark 41 games or fewer into a season since Danny Briere posted 21 goals in the first 41 games of the 2010-11 season. It was his seventh career two-goal game and fourth this season. Claude Giroux (14-37-51) has scored three or more points in three of his last games including Saturday's 6-3 victory over St. Louis. He has 43 such games for his career and five this season. Tyrell Goulbourne became the 550th skater and the 604th player to appear in a game for the franchise. Playing just five minutes and 23 seconds, he led the Flyers with four hits, including the early one that led directly to the Flyers first goal. THINGS TO KNOW: Buffalo is 0-2-1 in its last three games, 2-5-3 in its last 10 and 4-9-5 in its last 18. They are 1-3-2 since beating the Flyers 4-2 on Dec. 22. The Flyers have erupted for 12 goals in their two wins since a listless 5-1 loss to the Penguins Tuesday. Flyers goaltender Michal Neuvirth could start for the first time since Nov.28. He suffered a lower-body injury in a 3-1 loss to San Jose that put him on injured reserve until Dec.26. Neuvirth replaced Brian Elliott for the third period of Tuesday's loss, but Elliott has started the two games since. He has started back to back games three times over the last month. After today's game, the Flyers will have four days off per the collective bargaining agreement. They will resume practice at 4 p.m. Friday afternoon and resume play Saturday night in New Jersey. HEAD TO HEAD: Including playoffs, the Flyers are 116-89-20 all-time against the Sabres, which includes an 71-33-12 record at home. The Flyers have split with Buffalo this season, beating them 2-1 here on Dec. 14 but dropping the rematch in Buffalo on Dec.22, 4-2. The teams do not meet again in the regular season this year.